Pierre Auguste Renoir is one of the most famous representatives of impressionism. He became famous as a secular portrait painter – he was the first impressionist to become popular with the wealthy public, who considered it fashionable to order a portrait from Renoir. The rich people liked the slight hue of sentimentality inherent in the works of the artist. In the works of Renoir, a lot of pictures, where the central role is played by girls. The picture “Girl with a watering can” is remembered for its spontaneity, it looks like a randomly made photograph. The baby in the picture does not look at the viewer, but somewhere far into the depths of the garden. The girl has a dark blue dress, richly decorated with lace, with large decorative buttons, a lace petticoat and neat shoes. According to the clothing, it can be said that the heroine belongs to a wealthy family. In the hands of the crumbs – a small watering can. Most likely, with her help, the girl had just watered numerous motley flowers that flooded the garden. The baby looks pleased and happy, but at the same time serious – apparently, she is glad that she was assigned such a serious matter, and hopes to approach him with all responsibility. Gentle blonde curls intercepted by a red bow, cheeks reddened, close eyes seem cunning and playful. Technique canvas typical of late impressionism. This style is characterized by small, mosaic strokes, folding into a whole picture. Billing exclude the presence of contours and distinct boundaries; all objects are slightly blurred – so myopic people see the world. The colors smoothly transform one into another due to the abundance of halftones and shades. 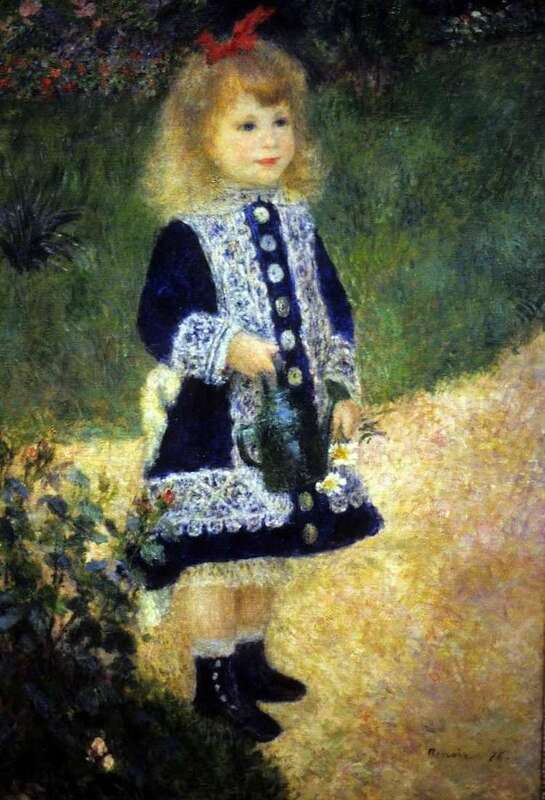 Renoir believed that for the transmission of the airiness of the landscape or portrait there were enough neat, gentle, blurry transitions – and the picture “Girl with a Watering Can” is vivid proof of this.